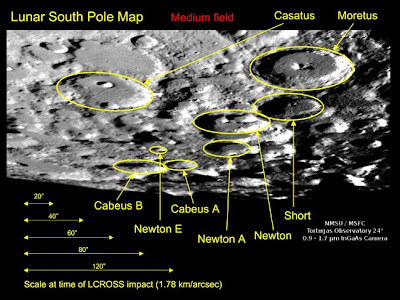 This is a follow-up to this post: NASA has now announced the crater on the Moon the missile-like probe LCROSS (Lunar CRater Observation and Sensing Satellite) will be slamming into: it's a crater at the South Pole called Cabeus A, and you can see it in this image below. It has a diameter of 40 kilometres and a relatively high concentration of hydrogen. Now all we have to do is wait until October 9, and hope that no more glitches cause LCROSS to start doing weird things like using up its fuel. Besides the scientific return, this mission is particularly exciting because it involves doing something that has never been done before: bombing the Moon. We have impacted an asteroid before, and that brought about much more attention in the press than most missions. To illustrate this, here's "Deep Impact" vs. Afghanistan. LCROSS has the potential to eclipse this, given that observations will not be made by NASA alone but by observatories all over the world as well that will certainly send in their observations to the local media. It's also going to be a big surprise considering that I doubt one in a hundred are even aware that NASA is less than a month away from bombing a crater on the Moon. When it happens we're going to have a lot of people waking up surprised when they see the headlines the next morning.